The scapegoat is typically a peripheral member of the community, and Jesus’ humble beginnings follow this pattern. His parents were neither wealthy nor powerful; he was born in the remote, insignificant town of Bethlehem; and he was born in a manger because there was no room in the inn. While his lineage (described in Matthew and Luke) traces his ancestry to King David, there is nothing obviously distinctive that would foretell his role in saving humankind. Indeed, Jesus told his disciples, “The very stone which the builders rejected has become the head of the corner; this was the Lord’s doing.” (Mt 21:42, see also Mk 12:10 and Lk 20:17) In other words, the foundation of the Lord’s plan was the stone that the builders rejected as unsuitable for any use. The shepherds were the first to hear of Jesus’ birth. Shepherds were unwashed and considered unscrupulous, and they had low status in biblical times. I think the story drives home the point that social status is unrelated to salvation. Whatever society thought about shepherds, God respected them. Jesus, child of poor parents, was born among animals. One might interpret this as further evidence for a humble birth, and to a degree I think it is. 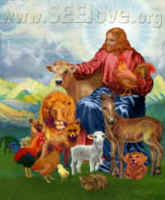 I think that including the animals at Jesus’ birth also illustrates God’s concern for all Creation, just as the revelation to the shepherds demonstrates God’s concern for all people, regardless of their position in human society. In many religions, heroes are born into wealth and privilege. Often, this person’s special status will position him to lead a military campaign to vanquish a people’s enemies. This is the “righteous” violence in the name of God that has excused violence throughout human history. This was not to be Jesus’ calling. Jesus would reveal the scapegoating mechanism, but to do so he needed to have both humble and human origins. If Jesus were God without human features, then he would be a poor model for us, for how can we imperfect humans hope to emulate God? The Bible describes Jesus not only as human but as a vulnerable child. He needed love and care so that we would not obey him as one obeys a powerful monarch but instead revere him for his understanding of God’s will and his faithfulness and obedience to it. If Jesus had been a child of privilege, he would likely have engendered jealousy, a manifestation of mimetic rivalry, and bitterness. If a mob were to later kill such a person, they might justify their violence on the grounds that this person was “arrogant” or didn’t deserve his privileged status. They could cite the sins of his wealthy ancestors as excuses to kill him. Therefore, if Jesus were to expose scapegoating and the scandal of sacred violence, his humble beginnings were necessary. To the degree that he was honored by the shepherds and the wise men, it reflected his relationship with God, not any special position within human society.